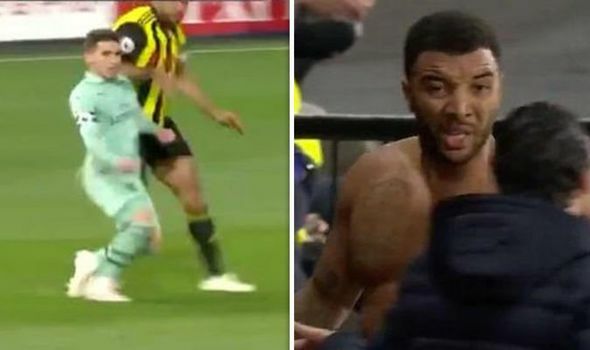 Deeney was shown a straight red by referee Craig Pawson after appearing to catch Lucas Torreira with his elbow after just 11 minutes. The striker argued with Pawson and protested his innocence despite leaving the Uruguayan clutching his face on the floor. And cameras then caught his eight-word tirade as he argued with Arsenal boss Emery before heading down the tunnel. “He’s a f****** p****," Deeney appeared to say. “I’ve ran past him." Former Arsenal striker Alan Smith was commentating on the game and believed Deeney deserved to see red. "Well he’s so much bigger than Torreira, sometimes you just try and arm off your opponent and you catch them in the face accidentally,” he said. “But if it was a deliberate elbow that’s a different matter entirely. “It’s a little swipe of the arm, something he did not need to do. “Just letting his man know he’s there but it’s a silly challenge. Moments before Deeney’s sending off, Pierre Emerick-Aubameynag scored the only goal of the game. Ben Foster failed to clear a pass from full-back Daryl Janmaat and allowed Aubameyang to close him down. As he finally attempted to clear his lines, Foster’s kick hit the striker and the rebounded past him to give the visitors a fortunate lead. Emery's side move above Manchester United and Chelsea into fourth in the Premier League thanks to their win. They are now just one point behind north London rivals Tottenham in third with five league games left to play. Next up for Arsenal is Thursday night's Europa League showdown with Napoli, over whom they hold a 2-0 advantage.